Belinda, better known as Bee to her friends, makes clothespin dolls in her Victoria, Australia, home. 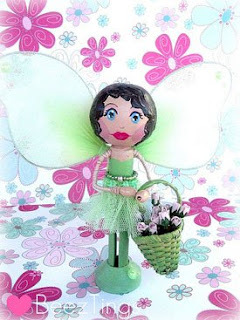 The 30-something mom was searching the Web one day, found the pin dolls and thought, "Wow! I would love to give that a go!" Always ready for a new challenge, Bee started making her own style of pin dolls a few months and found a whimsical release in the making. "The first lot were kind of OK, but by the time I had the second batch done, I was happy with the style and clothes, faces, etc. and had a great time making them." Bee says. "They are addictive. They all have different little personalities and the end product surprised me sometimes." Sorting out personalities and looks for each doll is a joy in itself. "I'm not into prim style, so I have made them more to my taste and put a modern twist to most of them," Bee says. "And I LOVE fairies!" As many Etsians can attest, posting on the site often leaves sellers buried in troves of new items posted and reposted every hour. "I love selling on Etsy, but being such a large site you seem to dissapear a bit," she says. "I also sell on a smaller Australian site and offline to friends and family." 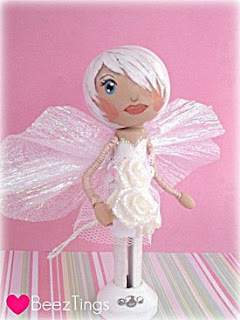 Bee's target market for her charming dolls is collectors or young adult girls. "The dolls are not really made for playing with, more as a keepsake/collectors type of thing." Asked her favorite thing about selling on Etsy, Bee says: "I really love when someone receives their item and takes the time not just to leave feedback but to email me to tell me how happy they are with it. I get a buzz out of that." Now you can own one of these great pin dolls! Bee has graciously agreed to a giveaway. Simply comment on this post or tell us about your favorite creation by Bee. Between Nov. 16 (today) and Nov. 23. Leave your comments here. We will choose a winner at random. So which adorable doll will the lucky winner get? Maisy!! She is the little fairy pictured at left. A talented go-getter, Bee has a few words of advice for dollmakers just starting out on Etsy: "Just make what you love in the style that you love, and it will show through in your work. "Work on your own style and get them to a stage where you are completely happy with them, and go for it! It's wonderful when someone loves your items enough to purchase them." These are precious! I love to see something unique and special! What beautiful dolls! Great find! OK, those are adorable! My daughter would love them. Great find. Yay!! Casey is our winner. Beeztings will be shipping your prize shortly. I LOVE these! So cute, I just can't get over them.